Studio/Run Time: Paramount Vantage, 119 mins. 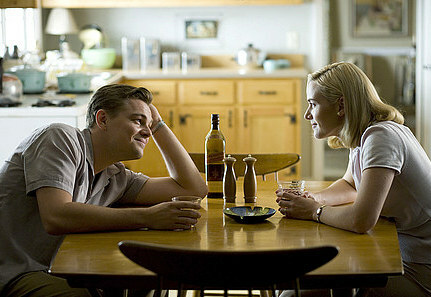 Nearly a decade after director Sam Mendes crafted American Beauty, one of the finest depictions ever of decaying love and sociological discord, he returns to nearly identical themes in an adaptation of the Richard Yates novel Revolutionary Roadironic reunion for Leonardo DiCaprio and Kate Winslet, whose passionate affair in 1997’s Titanic made for the highest-grossing movie of all time. While James Cameron’s romantic epic detailed the timeless appeal of star-crossed love, Mendes spoils the illusion by showing what happens after the honeymoon ends and resentment replaces infatuation. Yates’ novel tells the story of Frank (DiCaprio) and April Wheeler (Winslet), a couple of idealistic newlyweds who become trapped in the American Dream circa 1955—2.5 children, picket fence and a desk job. Whereas the book poetically described the psychological fault lines of its central characters, Mendes constructs a skeletal plotline of Frank and April’s struggle and defeat at the hands of conformity. Like Hemingway and Fitzgerald, Yates understands the inherent flaws of a dream that only has one method of attainment, and the film digs into the raw contempt of its source material. The opening scene offers the only hint of happiness amidst the fall of the Wheeler clan, as Frank and April dance innocently at a party. The next scene shows the couple post-wedding, with Frank’s hand cocked midair about to strike his wife, both raging about their respective claustrophobic roles as neutered office drone and housewife trapped by the daily grind. The Wheelers decide to flee their Connecticut suburb and move to Paris, where they reverse gender roles, with April earning for the family while Frank chain-smokes and rediscovers himself. Their escape soon suffers from increasingly dramatic obstacles as they realize that their affections might not be as eternal as their wedding vows suggested. Mendes has proved an expert choreographer of the human animal pushed to its limit in adverse environments. He creates a bleak journey through familiar realities, punctuated by desperate characters searching for purpose. The film’s skill at capturing corrosive romance is both its greatest strength and detriment—while frighteningly moving, it’s also the best example of cinematic birth control since Rosemary’s Baby. Be warned that there’s little peace of mind in the perpetual entropy of the Wheelers’ drowning relationship. But it’s hard not to cheer for these characters. DiCaprio and Winslet deserve mass praise for escorting the audience through their hell with amazing performances. Winslet is especially sympathetic as April; listening to her try to convince her husband of their individuality, pleading, “We are the most beautiful and wonderful thing in the world,” is all the more heartbreaking when you recognize the illegible love hiding behind her rigid body language and fluttering voice. Winslet has said that the role was so emotionally devastating that it took her three months to recover. DiCaprio usually looks frazzled in his action movies, but it’s truly unnerving to see his face masked in veins, broken down and displaying the one emotion he’s lacked in almost all of his films: defeat. The film’s final argument is almost unwatchable in its intensity, like seeing your parents at each other’s throats on the brink of divorce. If this sounds like the antithesis of escapism, that’s exactly what it is. It’s a harsh, uncompromising look at the death of hope, and it does its job far too well. But to ignore its message because it’s difficult to watch would be a mistake—this is pure art as parable, with Oscar-worthy performances to support it.